Major spoilers for seasons 1-3 of House of Cards ahead, read with caution! The rise and fall of TV characters is the essence of a good show, and what keeps us tuned in episode after episode, season after season as we see the stories of those we like or loathe unfold before us. No show has this idea at its’ heart more than House of Cards, with the fortunes of Frank Underwood being the driving force behind the political drama that packs a punch. The danger with that though is that the rise and fall of the characters becomes so intertwined with the show that it’s hard to determine which is most to credit, and that’s the problem with Season 3 of House of Cards. President Underwood, as he is now, has hit the top of his game. Seasons 1 and 2 showed his ruthless ambition for the highest office in the land and the lengths at which he would go to achieve them. The show was about the dark secrets and evil of his character and his Lady Macbeth, Claire, as they schemed and plotted their way to sure-fire success. Season 2 started to show him falter slightly, but he regained his stride. In season 3, though, now that he has everything he set out to get – the ambition and evil, so dark and decadent before, has gone. This season completely lacked the punch that the other two did. Memorable moments like the deaths of Peter Russo and Zoey Barnes were bolts from the blue that left you on edge and waiting for more throughout the season. There wasn’t much in the way of that this season, certainly not from Frank. Before, watching the show was exciting because you didn’t know what Frank could do at any moment and the steps through which his mind was moving to get towards what he wanted. Then he’d come back at you through the fourth wall with a little quote to show you his maniacal genius. This season felt like a completely different show at times, with none of this to be found in any real sense. 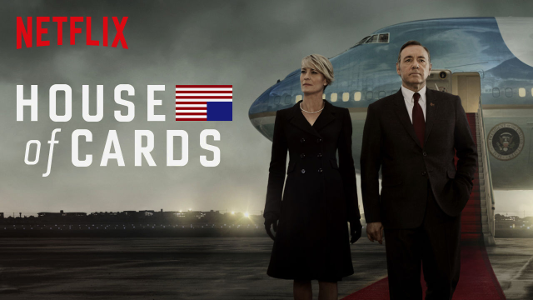 In some regards it was almost inevitable for the show’s pace to change when the Underwoods reached the White House – the house of cards had to fall at some stage as well. For it to turn into a largely personal story of both Frank and Claire’s decaying marriage and Doug’s quest to find Rachel (after he avoided nearly certain death at her hands) wasn’t a disappointment as such, but just a sharp contrast to what had gone before. Frank and Doug were two stony and fierce characters who could take anything on with ease and get their hands dirty with no complications, but that changed. Frank struggled at times with the burdens he had to bear with his office and his relationship while Doug couldn’t reconcile with his addictions – drink, work and Rachel. As a season that looks at the personal lives of these figures it is certainly very interesting, and it was intriguing to see what would happen, but it lacked a spark. Another problem that this season had is that it had a strange tendency to build things up and then let them go, and this was particularly important to the political aspect of the show. The most obvious example is that of Robert Mendoza, the Republican majority leader in Congress who was becoming the heir apparent to challenge Frank at the next election and his political rival. Mendoza was essentially dropped mid-season, inelegantly given a one-line explanation as to why he has left the face of the political map before things continue as usual. The reasons for this are that the actor in question left to do another show, but as Netflix tries to prove its worth as a platform the fact that it can’t keep hold of an actor that is central to the plot is a big disappointment. Also, the show features only three major political threads that unfurl through the season – Frank’s failed America Works programme, the Jordan Valley peacekeeping mission and the upcoming election campaign. Save for a few flashpoints, none of these stories really go anywhere in the season – with America Works stalled pending Underwood’s re-election, the Jordan Valley mission being almost entirely diplomacy gone wrong (under Claire’s supervision) and the election being a damp squib so far. What House of Cards holds on to is a sense of intrigue. Despite being a slow burner, it always captured your imagination as to what will happen next – even if it wasn’t as gripping this time around. The acting performances of the entire main cast are great again, with Claire Underwood (Robin Wright) getting more screen time and being more nuanced than ever in this season. The style of the show loses a little with the lack of dark and evil moments; that grimy Washington underbelly feel is hard to replicate when the star of the show works in the Oval Office though. What season 3 almost confirms though is the grand theory of the show being about the house of cards eventually being toppled – and that next season will be the last. We’ve had 3 seasons of 13 episodes each, representing 3 of the 4 suits in a deck of cards. A theory online even espoused that each of the seasons had a meaning: the first being clubs, as the backroom deals and shady manoeuvres of Frank played out; the second being diamonds, as the story with China plays out and Frank reaches for the glory; the third being hearts, as the stories of the love interests of the characters takes centre stage and the fourth and final one being spades, and that can only mean that graves – political or actual – are being dug. Another interesting point is that the introduction of Thomas Yates, a writer brought in by Frank to aggrandise his America Works programme into a book but who eventually becomes an unofficial biographer, could be a meta reference to the show’s unusual structure of naming each episode as a “chapter”. Could it be that Yates is writing the show and this is our hint at what’s to come? Above all things House of Cards is a clever show, and if these theories do indeed get proven right, then it makes the whole more than make up for its misgivings. With these grand themes considered, season 3 makes more sense and even though it lacked some lustre it was still an engaging season of TV. It’s not got the memorable moments or any real great plot, but as a bridge between the thrilling rise and what could be the crushing fall of one of the best characters to grace the screen in a long time it could have been the looking glass through which the entire thing really makes sense. Although the wait ‘til next February won’t feel quite as long as this time, knowing that the next season could be the finale does make this season seem worth it. The rise and fall of Frank Underwood is over the hill at the moment, I just hope that the same isn’t true for House of Cards.